Dorothy shouts to Toby to make sure he's packed for his trip to visit Joe and Melanie, while Todd tells Dorothy about how Doug and Pam's dinner went. Toby doesn't want to go and visit his parents, as Bouncer frets when Toby is away. He asks Dorothy to look after Bouncer all the time while he's away and she agrees. Toby rushes off to pack. Phoebe arrives, she looks pale and feels unwell. She thinks it must be the pill, the doctor said there would be side effects. 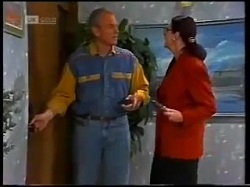 Brad arrives wanting a word with Todd, while Dorothy checks on Phoebe. Brad tells Todd him that he still owes him a favour. Brad needs Todd to do some undercover work for him as he whispers his plan to Todd. 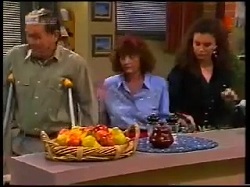 Gaby and Cameron bring Doug and Pam breakfast in bed. They're going to give them some extra pampering this morning after last night's shambles. Gaby has to rush off to work, while Cameron asks to sit down. He asks them if they think he is too old for Lucy. They say Lucy's growing up fast and asks what Cameron intends to do about it. Cameron wants to go for it, but wants to know what they think because of Brad. Doug says Brad is on again off again, and Cameron is old enough to make up his own mind. DOUG: Do you know what I've learned over the years. PAM: Oh here we go. DOUG: It's to not stick my nose in where it's not wanted. You'll have to work things out for yourself. Cameron thanks them for their help and leaves. Pam wishes Doug hadn't been so encouraging to Cameron, she doesn't want to see Brad get hurt. Doug didn't think Brad was really serious, in which case it's up to him to do something about it. Phoebe tells Todd that she's feeling a little bit better. Boof arrives. Todd looks worried as Boof explains he's just out of the joint and wanted to look up his old mates. Toby says he needs to get to class, when Boof stops him. He hopes Toby has kept his mouth shut. Todd tells Boof to leave him alone, as Toby heads off to school. Boof tells Todd he'll see him around, Phoebe tells Boof that he hasn't paid for his drink. Boof says he forgot but Todd will look after it, for old time's sake. When Boof leaves Phoebe can't believe Todd used to hang around with a guy like him. Todd says it was a long time ago. Cameron is cleaning up when Doug arrives and thanks him for breakfast. CAMERON: I know you don't want to get involved but what do you reckon about the sensitive new man of the 90s approach? DOUG: You mean like telling her you cry at sad movies? CAMERON: Yeah, and that I'm aware of women's issues and am after a better deal for women, that sort of thing? DOUG: Yeah could work. Maybe that's what Brad was doing with those flowers earlier? DOUG: Of course in my day we used to club them over the head and drag them back to our cave. Jill arrives and thanks them for their help last night. Doug says Jill's mother in law is something else, and Cameron encourages Jill to keep fighting her. Jill doesn't think he can put Ross through that, but Doug doesn't want that woman to poison Ross's mind against her. She wishes she could show Ross the letter that his father sent her but it would hurt him too much. She explains when Philip walked out on them she wrote to him and pleaded for him to come back but he wrote back saying he didn't want a bar of her or Ross. He also doubted he was the father because Ross is such a wimp according to him. Cameron says she should show the letter to Ross. Jill says she can't. JILL: You know how he feels. Imagine what it would do to him. CAMERON: You have an obligation to let the boy know the truth. JILL: I have an obligation to love him and do what I think is best for him. No matter what he might say or do, I'm still his mother. Lucy returns home as Jim gets off the phone to Paul. Jim says Paul is feeling very nervy after what happened with Andrew, but Jim can't blame him. Jim asks Todd why he's home. He thought Phoebe had gone home for lunch, but reckons she's still annoyed at him. He explains about Boof giving him a hard time. Jim is surprised Boof is out of jail and hopes Todd made it clear he doesn't want Boof hanging around. Todd says he won't do anything stupid as he grabs the sandwich that Jim has just made from him. Cameron arrives to have a word with Lucy, going into the living room, while Todd eavesdrops from the kitchen. He says he isn't worried about last night, but he wonders if she's free tonight. He's going to take her to a fancy dress party. Meanwhile Jim leads Todd away from listening in on the conversation. Todd sees Phoebe crossing the street. She is very out of sorts and tells him she doesn't want to talk. Todd thinks she's upset about Boof, but she just tells him she needs to be alone for a while. Gaby comes over and asks Todd if Phoebe is mad at her for knocking back her designs - but Todd doesn't know what is going on with Phoebe. Gaby resolves to call in on her later. Paul tells Lucy about thinking Andrew had swallowed Christina's ring. He's searched throughout the house and couldn't find the ring. Lucy doesn't think it could disappear, if Andrew didn't swallow it, it must be around somewhere. Brad arrives to say he's gotten a cheque for his board design. Lucy thinks it's fantastic and Brad suggests they go out tonight to celebrate. Lucy tells Brad she's going to a fancy dress party with Cameron. Cameron's hired a limo from Home James. Lucy leaves to go to work. Dorothy and Pam go to make more tea. Gaby arrives to speak to Phoebe. She tells her that just because she said no to Phoebe's designs, doesn't mean she doesn't think they're good. Phoebe understands. Gaby can see Phoebe is upset about something, but despite Gaby's offer to help, Phoebe doesn't want to talk about it and walks away. Lucy arrives wearing her outfit for the costume party to show off for Jim. She gets uppity when Jim suggests she wears a jacket, but he says it was just a joke. Lucy wishes Brad could see her in her costume, she hates hurting both Brad and Cameron. Lucy thinks she should maybe sort it out, but Jim says that can wait to later, she should go and have a good time. The limo arrives, but they can't see Cameron. Perhaps he doesn't want to give away his costume. Jim meanwhile is taking out the rubbish, when Cameron arrives in a Roman costume. He says there was a mix-up with Home James and someone got the last limousine, he'll have to take Lucy in a cab. Jim tells her she's left. Someone turned up in a limousine and they both assumed it was him. Todd tells Gaby that he doesn't know how to help Phoebe if she won't let them. Gaby guesses it could be her father's birthday, Todd agrees that if it the first one since his death it will be quite upsetting. Todd leaves to talk to Phoebe again. Pam and Doug arrive venting about this situation with Jill, explaining about Jill refusing to show the letter to Ross from his father. Gaby wonders why people lie like that, but Pam says Jill's mother in law thinks she's doing what is best for Ross. Doug looks outside and says Brad's wetsuit has gone. Pam only hung it up a few minutes ago, Doug says some mongrel must have pinched it. 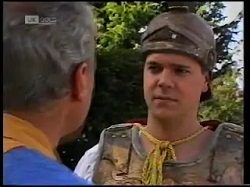 Cameron is on his bike, dressed as a roman, following Brad and Lucy's limousine. In the limo, Lucy wonders how the monk knew what she was going to ask. The monk shows a card which reads ‘Just clever I guess.' Lucy laughs and asks if there is any more cards. The monk shows her a card which says ‘I love you' in a heart with an arrow through it. Lucy says she really likes Cameron too but she doesn't love him, it's Brad that she loves. The monk takes off the hood revealing him to be Brad. He says he loves her. Cameron catches up with the limousine at the traffic lights and looks in the window to see Lucy and Brad kissing. He drives away. 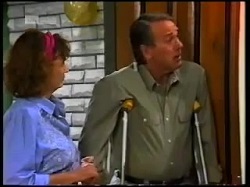 Jim tells Dorothy about the scare Paul had when he thought Andrew swallowed Christina's ring. They chat about Beth and Rod being inseparable at the moment and he hopes they'll realise the mistake they are making. Dorothy has to head off and drive Toby to the train station. Jim asks him to send Joe and Melanie his love. Doug and Pam arrive to tell them about Brad's wetsuit being taken. Dorothy says that's the second robbery in two days, as the famine relief money was taken from the Coffee Shop. Jim wonders if Christina's ring was stolen too, it would explain why it's gone missing. Todd asks Phoebe what is going on, he loves her. Phoebe says she doesn't want to lose him, but Todd promises she won't. Phoebe reveals she's pregnant.